Looking to get float valves shipped to your door? Jump to the bottom of the article for our recommendations. When you turn it on, a little arm pops out to turn itself off again. It’s the funniest feat of human engineering so far. But not all devices that exist to switch themselves off are “useless.” A float valve is one great example. A float valve is an air bladder hooked up to a water valve. When the air bladder falls downward, the water valve opens, allowing water through. 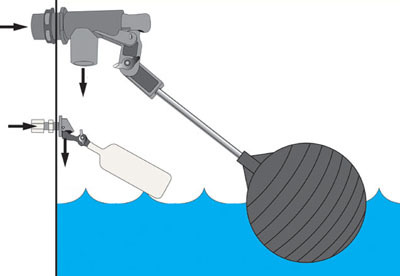 The water level rises until the float valve rises to the “up” position, which shuts the water flow off. A flush toilet uses this dependable piece of technology to fill its reservoir while preventing the water from flooding your bathroom. So you already use float valves every day, although you may have never heard the term before. In my world, the 5 gallon bucket world, float valves have a few uses. The most common is as a regulator for a five gallon irrigation system. It’s the key component to a fully automatic irrigation system that can water your plants for months without any intervention on your part. 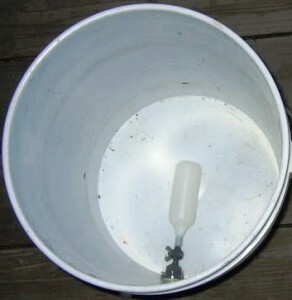 below, a 5 gallon bucket sports a plastic Kerick float valve, the most popular float valve used in 5 gallon buckets. It works well, it’s compact, and it’s cheap. It’s being used here for a self-watering bucket garden based on the Global Buckets model. Americans are lucky because they can get the Kerick float valve on Amazon.com. 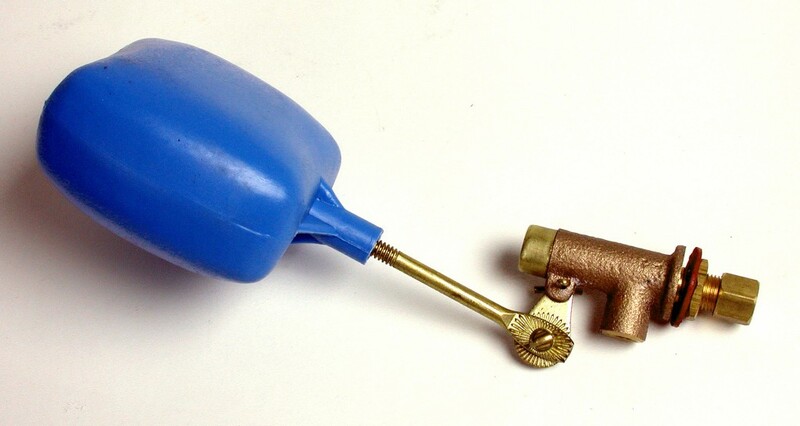 I’ve tried to find these in hardware stores, but invariably the guys show me to the huge toilet float valves, if they even know what I’m talking about at all. I have seen folks modify a huge toilet-sized float valve with a hacksaw to cram it into a 5 gallon bucket. So if you’re determined, you’ll find a way. For the larger toilet float valves, use the universal compact Kohler model. brought a vacuum cleaner to fit on the top of a 5 gallon bucket from lowe’s Works great.